Director: Tim BurtonWriters: Helen Aberson, Ehren KrugerStars: Colin Farrell, Michael Keaton, Danny DeVitoSummary: Holt was once a circus star, but he went off to war and when he returned it had terribly altered him. 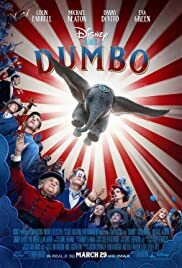 Circus owner Max Medici (Danny DeVito) hires him to take care of Dumbo, a newborn elephant whose oversized ears make him the laughing stock of the struggling circus troupe. But when Holt's children discover that Dumbo can fly, silver-tongued entrepreneur V.A. Vandevere (Michael Keaton), and aerial artist Colette Marchant (Eva Green) swoop in to make the little elephant a star.